Heat oven to 375°F. Spray large cookie sheet with cooking spray. Separate 1 can of dough into 10 biscuits; keep second can refrigerated. Press each biscuit into 3-inch round. Place 3 pepperoni slices or 6 mini pepperoni slices and 1 piece of cheese on each dough round. Wrap dough around filling, pinching edges to seal and form ball. Repeat with remaining can of dough, pepperoni and cheese. Leaving a 4-inch hole in center, arrange 8 balls, seam side down and sides almost touching, into ring on cookie sheet. Arrange remaining 12 balls, sides almost touching, around outer edge of first ring. Brush rings with beaten egg. Sprinkle with Parmesan cheese and Italian seasoning. Bake 18 to 20 minutes or until golden brown. Meanwhile, in small microwavable bowl, microwave pizza sauce, loosely covered, on High 45 to 60 seconds or until warm. Carefully slide wreath from cookie sheet onto serving platter. 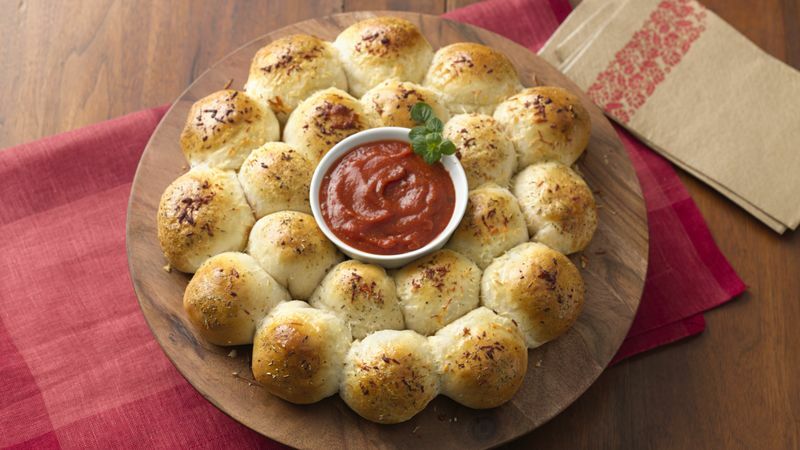 Place bowl of pizza sauce in center of wreath. Garnish with fresh oregano, if desired. Serve warm. Wrap each biscuit around 3 slices of pepperoni and piece of cheese, pinching edges to seal.